Baby Rothschild’s giraffe, Fennessy, is preparing for his first birthday at West Midland Safari Park. Born on 14 January 2017 to first time mum, Arusha, he joined the herd of eight giraffes and was already a towering six-feet-tall at birth. Still steadily growing since his birth, he has now reached a lofty 10-feet-tall, and the healthy youngster is showing no signs of slowing down. 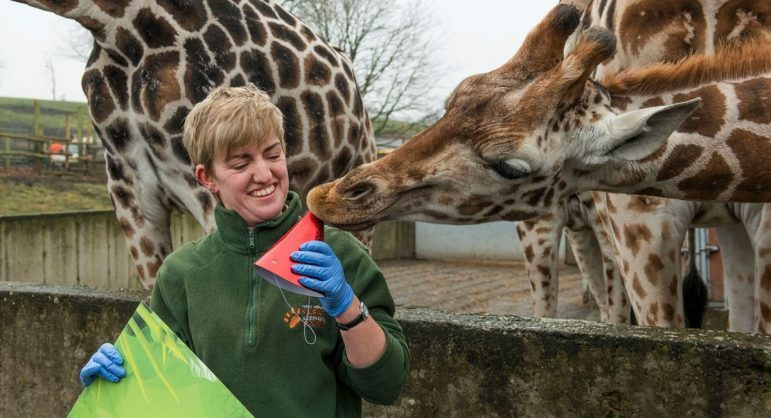 Keepers ensured that Fennessy prepared to celebrate his first birthday in style by presenting him with a gigantic birthday card and feeding him his favourite treat of chopped banana and apples. He enjoyed the celebrations so much that he even tried to take his keeper’s party hat – giving it a playful nudge and nibble – proving he is still very much the youngest of the herd. In the wild, numbers of giraffe are dropping at an alarming rate, which is why any birth is extremely important for the longevity of the species. The Giraffe Conservation Foundation (GCF) works towards securing a sustainable future for all giraffe populations in the wild and ensuring that these beautiful creatures are protected. In honour of the fantastic work the GCF does, keepers named the calf after the founders and directors of the brilliant charity – Dr Julian and Stephanie Fennessy. 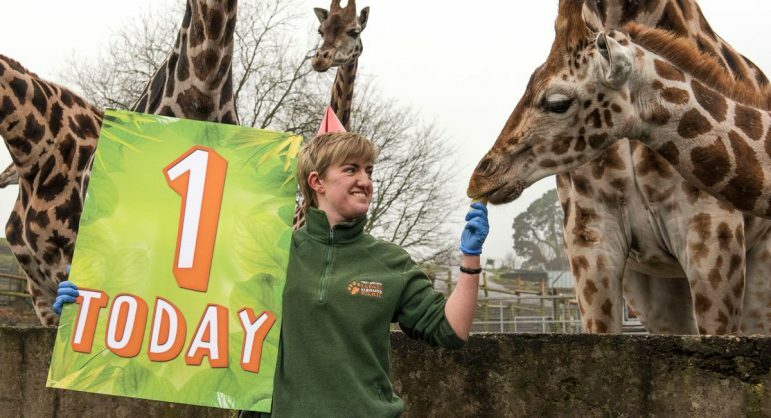 Celebrations for Fennessy’s birthday start off a year dedicated to lots of giraffe-themed events for the Park. During May half term, staff have decided to devote an entire week to raising money for giraffes. Guests will be able to find out more about the conservation efforts focussed on this incredible species and can participate in giraffe-themed activities. All of the money raised during the week will go to the GFC to support their vital work and research. The Safari Park is also the official Education Partner for Worcester Stands Tall – a public art exhibition of decorated giraffe sculptures due to be dotted around the streets of Worcester during the summer of 2018. The event, facilitated by Wild In Art and brought to the city by St Richard’s Hospice, will enable lots of schools and renowned artists to design and decorate the sculptures. Larger sculptures will eventually be auctioned off to raise money for the hospice. For further information, visit the website. The giraffes can be seen in the four-mile safari (weather permitting), which is included in the winter admission charge of £20.00 for adults, £15.00 for children aged 3-15 and £18.00 for concessions. Admission includes a free Return Ticket or safari gift. Adventure Theme Park rides are closed during the winter season. Giraffe Feeds are also available to purchase through the Park’s VIP Experiences – perfect for an extra special treat to meet and feed these majestic creatures.